Amber is not just an amazing stone, which is successfully used by jewelers, creating necklaces, earrings, brooches, rings etc. it is more Correct to say that the resin solidified millions of years ago. Amber (jewelry) with it always in fashion. Most often it is framed in gold create a stylish and elegant decoration. Contraindications for wearing this stone does not exist. In addition, it is believed that it protects its wearer from troubles and misfortunes. And pregnant women amber helps deliver a healthy baby. It is not customary to use amber jewelry for body piercing. The only exceptions are gold earrings for ears, encrusted this unusual stone. Combine amber with silver, enamel, ivory, wood and precious stones. Insertion of the amber may have many different and bizarre forms. Wear amber necklace (beads) to emphasize the tan of his skin. Amber just enough to combine with the wardrobe. But there are certain rules. Classic amber yellow color should be worn with clothes of different shades of brown or green in color, this stone is as well profitable emphasize black or white suit. Please note that the amber light tones more suited to blue eyes, brown-eyed and gray-eyed girls more than to face stone will be dark shades. Avoid excess amber jewelry worn at the same time. To give your image a highlight, wear either a necklace or earrings, or brooch. Jewelry made of amber keep on a soft surface to avoid scratching the stone. Wash contaminated items in warm water with soap and a small amount of ammonia. To check out the natural amber you purchased or fake, dip the stone in clean water. A genuine stone will sink. When heated, man-made amber produces an unpleasant smell and damage - proof. According to astromineralogy, amber suitable for all zodiac signs except Taurus. 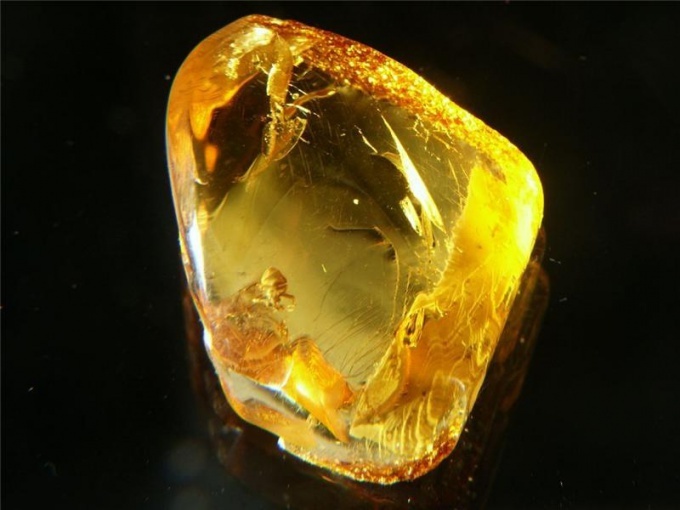 Amber is one of the oldest gems used by humans, is quite popular for thousands of years. Very often, the stores can meet its imitation and clever forgery. The most reliable method of testing stone for naturalness is infrared spectroscopy. Consumers can only use the "popular" methods. Sprinkle on the stone a drop of acetone or alcohol. If the surface will stain or it will become sticky, so before you dig "young" is not stable amberthat can be extracted from resins of contemporary trees. Keep the acetone on the stone for more than three seconds to amber dimmed by prolonged exposure to chemistry. Light amber chips or shavings. You should feel a pleasant smell, something like the scent of Church incense. Synthetic analogue of amber will exude the smell of burning rubber, accompanied by dark smoke. Mild swipe the knife across the surface of the stone. With natural sprinkling a small crumb, and simulation – spun wool. Pour a glass of water, add 3 tablespoons of salt and drop it on the bottom of a piece of amber. Natural stone needs to rise to the surface. Don't forget to wash after this stone with water, so that it formed a salt crust. RUB the stone to give it a negative charge. If in this state, he will not take even a slight electrifying, so you're holding a fake. Put the amber under UV rays. Under their influence the natural stone will Shine a bluish color. Milk white color distinguishes these artificial stones as ambroid and digging. Synthetic imitation will have any other color. Consider the inclusion (inclusion) present in the stone, paying special attention to the insect trapped in it. Wings of prehistoric bugs and flies should be disclosed, which is a sign of the struggle for life ancient insects stuck in the resin. Counterfeits inside the stone already placed the dead insects, filling their plastic. Note the appearance of an insect: having even a cursory knowledge of entomology, you can determine that could not get into the stone in connection with inappropriate age, habitat and appearance. Amber is a fossilized resin now rare conifers of the family Sciadopityaceae. Many millions of years ago when the resin was still viscous, it was stuck insects, plants, even those which now exist in nature, and have remained in the solid state. 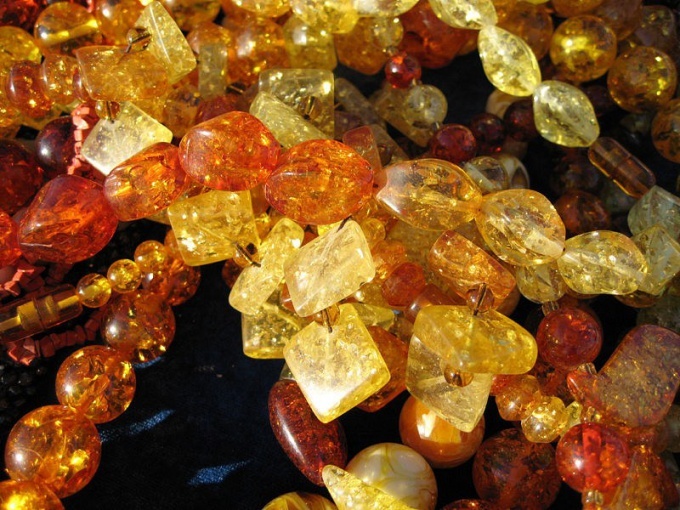 Amber is a precious stone, which in ancient times attributed a magical power, and the ability to cure illness. Amber was formed from resin millions of years ago. Now it is produced in many countries on different continents, sometimes it is detected during archaeological excavations or underground work. 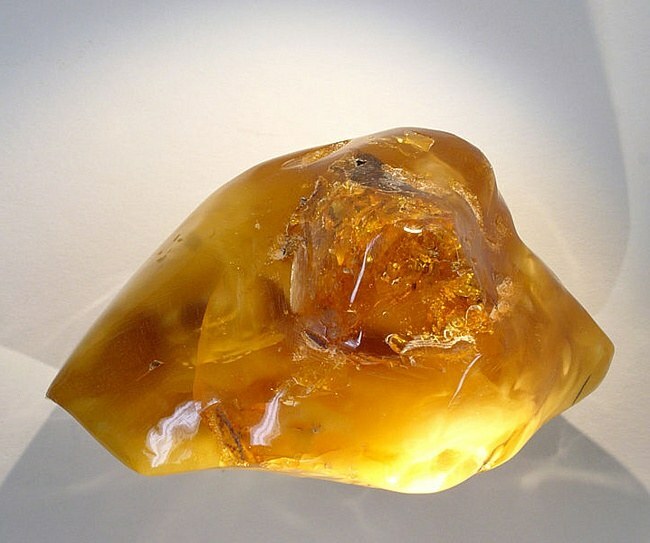 For example, the construction of the bridge in Kiev, workers found large pieces of amber. This may seem surprising, but amber remained in those places, where once was a big water, but now the flow of the river. Most amber found in the Baltic and North seas. In the Baltic States, Poland and other countries on the Baltic sea coast there are many hunters among the amber residents of these places, as well as tourists. However, it is not as easy to findas it seems. Amber is often found, and very small size, after storms, when it raises from the depth of wave along with the garbage, which a lot of the sea, and algae. Gemstone is fragile, but break it not as easy as glass. Color palette of amber varies from white to yellow with all shades of almost red and even black. Especially valuable is the amber with inclusions of air bubbles or water, and the ancient insect. Since ancient times, believe that amber has magical power to heal many diseases, to attract good luck and to ward off the forces of evil. It was worn as a talisman. It was believed that this stone protects warriors in battle, on amber wrote the ancient philosophers and thinkers. Amber lit a smoke with a pleasant aroma fumigated the room in which were patients, it was believed that the smoke is healing, cures diseases of the nasopharynx, eyes, ears, respiratory and infectious diseases. Amber make Smoking pipes and mouthpieces to tobacco smoke did not cause lung disease. Perhaps the ulterior motive is that the amber necklaces help with a sick thyroid gland, since it is known that amber contains iodine and succinic acid. In order for an amber necklace really helped, recommend them to purchase of polished and rough stone. At all times amber made figures of animals in the form of amulets, various products, for example, in the shape of a miniature mug of beer, which is kept in the amber Museum in the Lithuanian town of Palanga. In Poland make vodka amber containing amber, that cures sore throat and colds. Many fine works of art made from this warm stone which reflects the sun. For example, such a magnificent creation of the craftsmen, St. Petersburg lost and restored "amber room". Thanks succinic acid aktiviziruyutsya metabolic processes in the body and improves the functioning of digestive tract. Magic stone has antibacterial and anti-inflammatory properties. 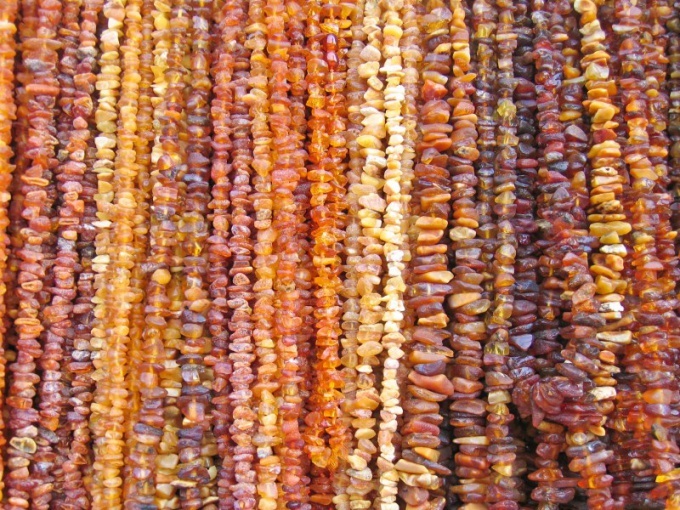 They also say that if amber is worn on the chain, it will help to get rid of stones in kidneys and gall bladder.